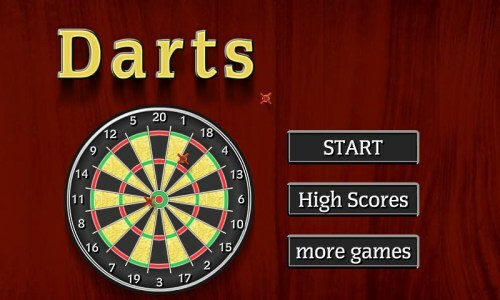 Description In this game you will need to play darts with 501 points. The dartboard is divided into 20 areas with scores of 1 to 20, each area is further divided into 4 regions, the larger 2 regions score the same as the score for the area, the outer thin region scores 2 times as the area score, and the inner thin region scores 3 times as the area score. The bullseye (the red dot at the center) scores 50 points, the bull's ring (the green ring around the center) scores 25 points. In each turn you throw 3 darts, each time you throw a dart, the score you get from the dart will be deducted from the initial point of 501, the object of the game is to deduct the points to exactly zero. The last dart you throw must hit a double or hit the bullseye. If your points is reduced to below zero, exactly 1 or to zero but without hitting a double or the bullseye with the last throw, then your turn is forfeited and the score will be reset to that before the turn starts. Try to use the minimum number of darts to finish 501 points.